"I can't ride a bike with my skirt on, can I?" I don't know how to word my recommendation for this series in such a way that my colleagues here at digitallyOBSESSED won't be bribing my editor for the follow-up discs. 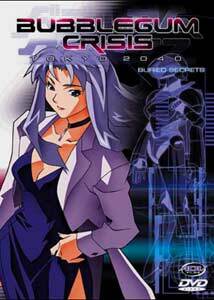 With the release of its fourth disc, Bubblegum Crisis Tokyo 2040, now moves into the realm of a must own set, and not just because it features a collection of cute anime girls who don battle armor to fight renegade robots. While many series pad the middle episodes with filler material, BGC 2040 completely blows you away with the developments thrown at you in these four installments. With many other series, this would be a time when interest might start waning, due to the lack of movement in the plot. Not so with this one, as we are in the thick of things now! It is beginning to get complicated. All eyes continue to focus their attention on the underground regions outside new Tokyo, which was the epicenter for the earthquakes which rocked the city years ago. Sylia (Satsuki Yukino) seeks outside help to procure equipment and information, and then approaches the Knight Sabers offering double their usual fee to help locate her father's missing laboratory. When Nene's (Hiroko Konishi) curiosity about Sylia's past forces a confrontation, the integrity of the team is placed in danger, and as Priss (Yu Asakawa) and Linna (Rio Natsuki) search for Dr. Stingray's lab, Nene distances herself from the team, unable to cope with what she has learned. Meanwhile Brian J. Mason (Joji Nakata), Genom's boomer hating chairman, plots to use the Knight Sabers for his own purposes. With rumours of the disbanding of the A.D. Police, Leon (Kiyoyuki Yanada) takes his investigations to an unofficial level, and as the various factions come together, they each find new discoveries that reshape their coexistence. As this series moves on, the complexity of the story increases, as do the hidden agendas behind each character. With each new episode come more revelations, which keeps the interest level high as to what will happen next. The modern animation style and effective soundtrack make this a great viewing experience. I really like the character and mecha designs, and the cinematic framing is very tastefully done, with lots of interesting angles and perspectives used, without becoming too "arty". While the romantic interactions between the characters is fairly subdued, the other levels of their personal interactions are being well established and are quite dynamic. This adds a lot of depth to the entire cast, and while we are exposed to these developments, they are delivered in stages, without fully establishing everything. This delivery uses the audience to interpret the relationships a lot, which is often misleading and adds to the mystery. There is also no shortage of action, though it is becoming increasingly difficult to cover the synopsis without blowing several major plot points that should be discovered through viewing the series. Image Transfer Review: Only minimal amounts of aliasing detract from an otherwise flawless presentation. Colors are bold when needed, and subdued as appropriate. Black levels are fine as is the overall contrast. Audio Transfer Review: The original Japanese stereo, with English and Spanish stereo dubs are provided. As with previous discs in the series, these are well delivered with good use of ambience and the show's underlying hard rock score. My only real gripe is how the menu audio kicks in halfway through the theme song. Extras Review: We get more front end trailers, this time for Spriggan, Arc The Lad, Gasaraki, Generator Gawl, and A.D. Police, plus the standard ADV Mix promo. These can be either title skipped through or bypassed completely using the menu button on your remote. Though listed as character profiles, this disc covers some of the technology the Knight Sabers employ in their battles against the boomers, including Priss' motorcycle, the Mobile Pit and the Moto Slave. These are single screens with static shots of the devices, not spoiler laden character overviews as in the last few discs. Thankfully, my previous criticisms of the spine art have been addressed, and this episode now matches the previous one. Now, if we could only get Nene (who is featured on the inset card) onto the cover. More great action, an evolving and deepening plot, and much more character development highlight disc number four in this eight disc series, which is probably my favorite so far. I have no problem recommending this series now that we are nearing the halfway point. We still get decent value with four episodes per disc, and the content is well done, very fun, and interesting to watch. If you are like me (that's a scary thought!) you'll be chomping at the bit for the next disc.